Are you interested in plants? Or perhaps you'd simply like to learn a bit more about horticulture? Then you should consider trying out for the California 4-H Horticulture Team! Every year, there's a horticulture contest at State Field Day at UC Davis. 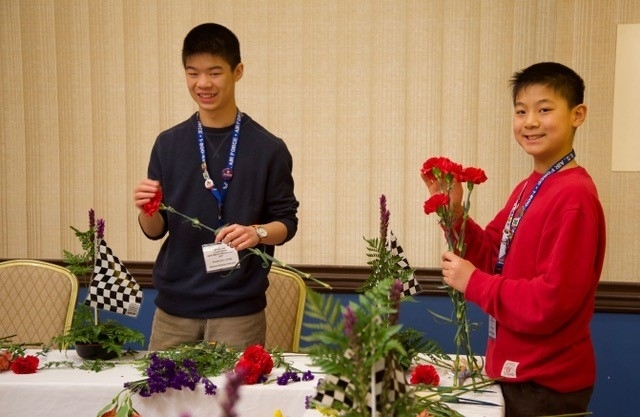 The contest is open to all ages, but if you're 15-18 and you score in the top four, then you can qualify for the state team and represent California at the National Junior Horticultural Association convention. If you'd like to get some practice first, you can also try the horticulture contest at Bay/Coast Area Field Day. Last month, I attended the 2017 National Junior Horticultural Association Convention in Indianapolis, Indiana as part of the California 4-H Horticulture Team. It was an amazing experience! The convention was a 4-day-long opportunity for youth all around the nation to learn more about horticulture through a myriad of contests, workshops, field trips, and other activities. The highlight, as it is every year, was the Horticulture Identification Contest, where contestants had to identify a hundred different samples of plants in four different categories: fruits, vegetables, flowers, and landscape ornamentals. These could be presented in almost any format, ranging from fruits and flowers to seeds and leaves or even pieces of bark. In all, attending the convention was a wonderful experience. I learned a lot about horticulture from all of the different activities, ranging from attending a hands-on flower arranging workshop to taking a tour of POET Biorefining to playing a round of horticulture-themed Jeopardy. It was also fun to have the chance to meet and and hang out with kids interested in horticulture from all over the nation. Perhaps the best part about the attending the convention was being part of the California team. Through months of study sessions, we had not only improved on our horticultural knowledge, but also had also become good friends. By the time of the convention, we were a solid team, a close-knit group of collaborators working toward achieving a shared goal. The friendship and camaraderie we experienced together is an experience that is truly unparalleled. Finishing 3rd, 2nd and 1st! Our 4-H team did quite well: we finished 3rd in the horticulture identification contest, 2nd in the state display contest, and 1st in the horticulture Jeopardy contest. In addition, our California open team also did well: they placed 1st in their category for the horticulture identification contest. I'm looking forward to competing again next year! For more information about the 4-H Horticulture Team and the State Field Day competition, please contact DeAnn Tenhunfeld at dtenhunfeld@ucanr.edu.